This extensively researched and documented book traces one of the oldest item of insignia still used by the United States Army. Shoulder straps (shoulder boards) were used as an insignia of grade (rank) by the U.S. Army since the 1830s. The book traces their evolution from their introduction to modern times with a particular focus on the Civil War period. It is illustrated with 87 photographs, including seven full page color plates of 42 different shoulder straps. These include period images of straps being worn and modern photographs of artifact shoulder straps. In addition, there are 29 line drawings from manufactures catalogs, period lithographs, Army regulations and other sources. The book details when and why Army regulations changed, dating and manufacturing techniques, collector mythology, common misrepresentations, etc. 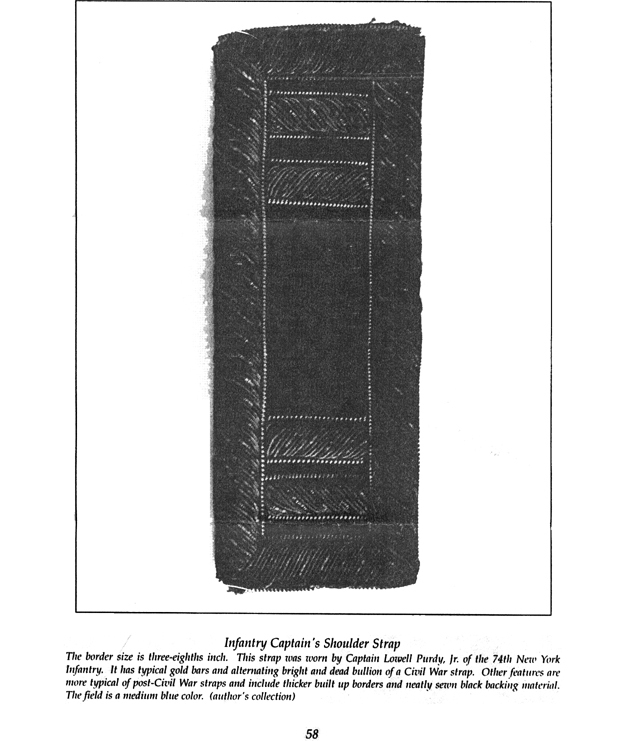 It also contains a brief discussion of U.S. Navy, Confederate, and lodge shoulder straps. Tables list information regarding branch of service colors, manufactures, etc. Much of this material has never appeared in print before. Soft Cover, 212 8 ½ by 11 inch. Pages with notes and index. Contact Howard Lanham via e-mail.